Over the past ten years I have done a lot of painting. Of walls, doors, ceilings, door frames and skirting boards. Also some painting of the outside parts of the house. I loved choosing the colours and considering what fabrics and furnishings would best complement the colour on the walls. This, I thought, would be the closest I got to ‘real’ painting, as – sigh – I still well remembered the lack of comment from my art teachers when I proudly presented them with my own paintings. Art, I thought, was simply something I had no aptitude for. No teacher encouraged me or gave me praise; no teacher gave me any basic skills or techniques. 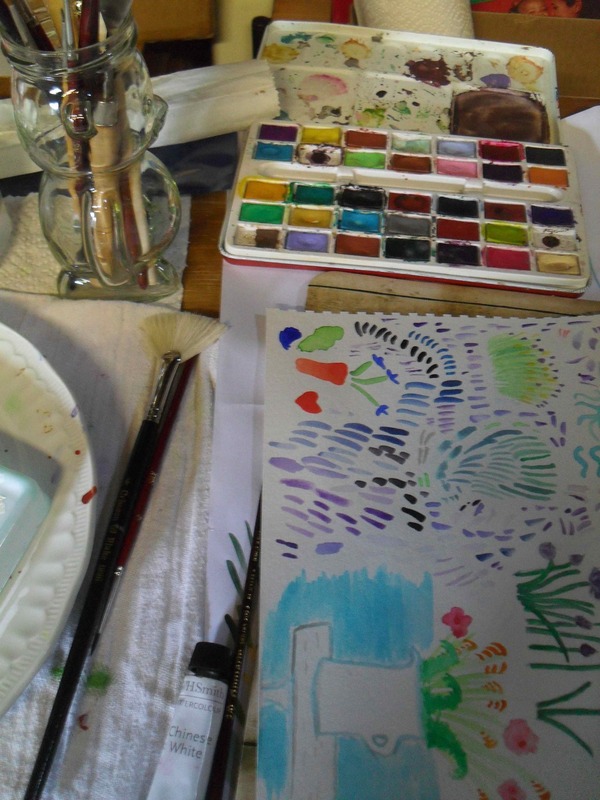 Yet, undaunted, I tried again and again… At age sixteen I bought a basic set of watercolour tubes and did a bit of painting at home. However, the paper crinkled as I added the watercolours, I didn’t know how to mix the paints properly to get the colour I wanted, and I was disappointed with the results. Almost twenty years later, having encouraged my daughter and son to paint, to have fun in creating swirls, splodges and – whatever! – I thought to myself, why not? They’re having fun, so why can’t I? I dug out my old paint tubes – and my one tiny sketchbook – and invested in some new paper and decent brushes. I borrowed my husband’s excellent book The New Encyclopedia of Watercolour Techniques by Diana Craig and Hazel Harrison, and began to really learn things in the snatched moments that I read and studied the book. I have found great joy and peace in painting – particularly as in the past few months I have received more writing rejections which, of course, have disappointed me. I am so, so proud of my first attempts at ‘art’ and wonderfully, too, painting has inspired me to write poetry about painting, which again, I am so, so grateful for. If you’ve ever thought ‘I was just not meant to do that…’ about any creative activity, I’d urge you to rethink it. Unlearn what you’ve learnt, and just give it a go. Whatever the world thinks of your painting/poetry/sewing/cooking/knitting etc. it doesn’t matter. You would have put in some valuable soul-work in the actual creation and the rewards will be many.